Sports fans around the world are continuously on the hunt for their next piece of authentic autographed memorabilia to add to their collections. Autograph collectors need to be sure what they are purchasing is really an authentic signed item and that is what makes the autopen device so frightening as the signatures it creates look like the real thing. They are not new either, autopens or as they are sometimes called, robot pens have been in use for decades. 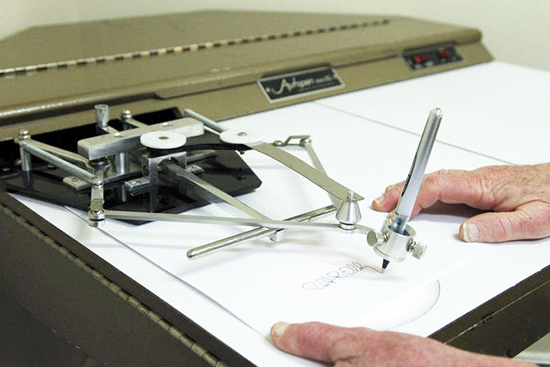 Autopen or robot pen devices have been around for decades and as technology improves, it gets harder to tell real autographs from forgeries. The autopen device is a scary thing for collectors as the machine replicates any signature by using a real pen. Some of these devices can produce an exact replica of a signature and it can be really hard to tell the difference between a real autograph and a signature created with the autopen device. It is very concerning how easy the process is to replicate a signature with these devices. The device was created for busy politicians or people of interest to provide their constituents and fans with a personalized response that includes what their autograph looks like. Now autopens have made their way to the sports collectibles industry and unscrupulous individuals are using them to make a fast buck on unsuspecting consumers. They frequently add their own certificates of authenticity that are not worth the paper they are printed on. Here is Barack Obama’s signature replicated with an autopen. These days anyone’s signature can be reproduced with an autopen which means it is more important than ever to go through companies that witness the athletes signing. Upper Deck Authenticated was founded on the ideal of providing fans with authentic signed items of the game’s biggest stars. They may be a little more expensive than some of the other signed items you see out in the market, but you have the peace of mind of knowing you are receiving the real thing. Upper Deck staff witnesses every signature and the athletes sign a document affidavit after the session indicating they did in fact sign every item with their own hand. Each piece is affixed with a special serial-numbered hologram and a matching serial numbered hologram is affixed to the UDA certificate of authenticity. When you go to search for signed memorabilia, take great care when making a purchasing decision. Bargains in this industry often mean the item is not what you hope it will be and with devices like the autopen, even third party authenticators have trouble telling the real thing these days. Check out the full line-up of Upper Deck Authenticated collectibles at www.UpperDeckStore.com and purchase with confidence! Have you been taken advantage of by an autopen device when you purchased signed memorabilia you thought was authentic? Share your story in the comment section below. Oh, and in the time it took you to read this and watch the attached videos, an autopen could have rattled off dozens of perfectly scripted forgeries with little supervision.